Open the .pkg file and follow the installer's instructions. 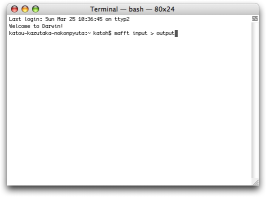 Add /usr/local/bin/ to your command-search path (Mostly unnecessary on MacOSX 10.5-10.12). Copy an input file (example) into your 'Home' folder (Finder → PLACES → your_username). Open a Terminal window (Finder → Applications → Utilities → Terminal). The full path name (/usr/local/bin/) may be necessary, if it is not in your command-search path.